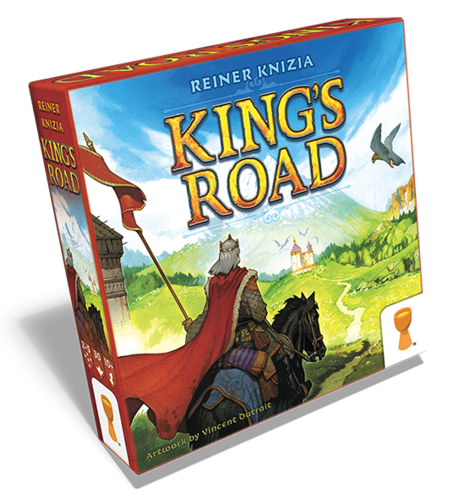 Grail Games is proud to present a beautiful new game, from the dream team of designer Dr Reiner Knizia, and illustrator Vincent Dutrait! In King’s Road, the players are nobles who are attempting to gain power and influence within the king’s many provinces. As the king travels along the road that connects all the major landmarks within his territory, he will allow the most influential noble in each region to govern in his stead. Over time, the most favored noble will win the game. King’s Road is an area-majority game. Each player has identical decks of eleven cards. On a turn, players simultaneously select the three cards they will play, and in what order. 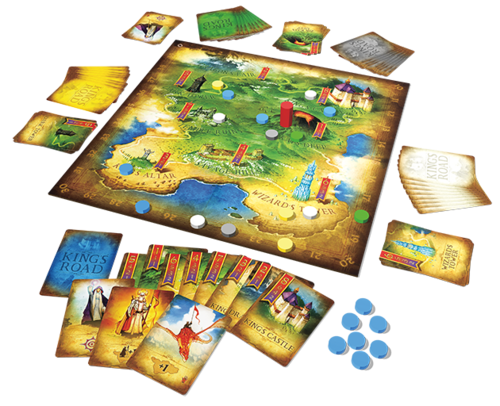 To win, players not only have to influence the king as he traverses the land, but attempt to read the minds of their opponents. King’s Road re-implements the game Imperium, previously only available within game compendiums.